Project Wild Thing, a wonderful film about reconnecting children with nature, launches today – and I can't recommend it highly enough. Film-maker David Bond was worried that his two young children weren't getting the chance to enjoy nature as he had when he was younger. 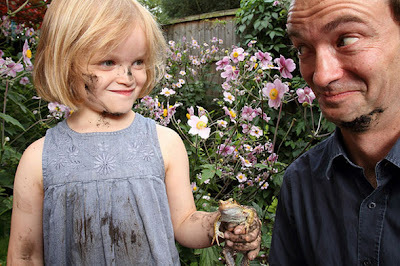 "I attached a camera to my daughter's head to see exactly what it was she did all day," he told the Parentdish website. "Over a quarter of her time was spent watching screens. Just four per cent of her time was spent playing outdoors – the same amount of time as she spent in the bathroom." Stranger danger, traffic, computer games: we know the reasons that children are losing touch with the natural world, and moreover we are starting to understand the benefits to them of being outside – and the losses they suffer from being denied it. So how can we reverse the trend? David decided to investigate whether modern marketing techniques could be harnessed to 'sell' nature to children in the same way that they are sold fizzy drinks and smartphone games. The results are surprising and hilarious – not least because of the huge groundswell of support the Project Wild Thing movement has garnered: over 300 organisations and well over 4,000 individuals, all hoping to change the way the next generation feel about the great outdoors. "As a parent I realised that the key to reconnect my kids with nature is to reconnect with nature myself. Children – especially young children – take their lead from their parents," says Bond. "We started going outdoors as a family again. My kids loved the expeditions and mini-adventures, and I loved that they were enjoying themselves so much (and that it wasn't costing a fortune). Small changes – like walking or cycling to school – can lead to big ones. Imagine if every child cycled or walked to school (and their parents cycled to work). There would be fewer cars on the roads. Children might start to return to play on the streets. People would be fitter. Councils would be forced to invest in a green transport infrastructure to cope with demand... all this just from opening the front door and stepping outside. Click here to find your nearest screening of Project Wild Thing.